Aah, the mum tum. The pooch. The overhang. While the post-baby jelly belly is something most mums expect to encounter to some extent, fixing it isn’t always as straightforward as you might first imagine. It took nine months for your tummy to get that big, so it’ll take at least nine months to fix it, right? But what if it doesn’t shrink? What if you still look 4 months pregnant months (or even years) after delivery, and nothing you do seems to be shifting the baby weight? These muscles form part of a wall of muscle that holds the uterus, intestines and other organs in place and lends support to the pelvic floor. Typically, the gap will go back to normal around 8 weeks postpartum. However, the gap sometimes does not close on it’s own, which can cause a number of health issues (not to mention leaving you perpetually frustrated at your stubborn tum). Before you start to panic, it’s not all doom and gloom. 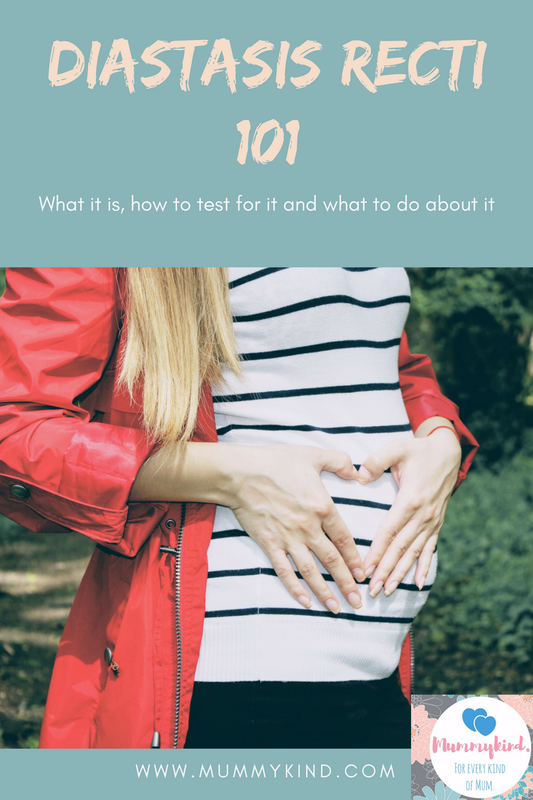 Below is a list to help you check yourself for a diastasis, and what to do if you think you have one. Lie on your back with your feet flat on the floor, knees together and bent. Raise your head and shoulders off the floor so that you can see your tummy. Place your hand flat on your stomach, fingers pointing towards your toes. Try and feel for the gap between the muscles above and below your belly button. You might feel them squeezing your fingers tightly. You might not. That’s ok too. Note how many finger widths you can fit in the gap, and how high up your torso that measurement is. You may find your diastasis is larger at the bottom than the top, or vice versa. Typically a diastasis recti is measured as 1 finger width = 1cm. Therefore, if your diastasis is 3 finger widths, it is 3cm wide. If you feel a gap wider than 2cm, you have a diastasis. A gap wider than 4-5cm wide is considered severe. traditional crunches, sit ups and planks, as these can increase intra-abdominal pressure and actually make the gap worse by putting too much strain on the muscles, effectively pulling the gap wider rather than closing it. Alternatively, there are many diastasis recti repair exercises on youtube, which you may like to follow along to. Just be careful you don’t put too much pressure on your stomach, as this can delay your healing and even make the condition worse. Last but not least, if exercises from your physical therapist fail to improve your condition, surgery is always an option, however this should be a last resort, and always discussed fully with your medical team. Needless to say, if you’re experiencing any physical difficulties postpartum (be it months or years) you should always speak to a medical professional about your concerns. While having a Diastasis Recti can be a pain (both literally and figuratively), it can be improved over time. Previous Post ENDED: Mummykind’s BIG Birthday GIVEAWAY! Next Post Bath boohoos to Bath wahoos!